Last week I joined a group called the Sourdough Sprouters on Facebook that is sharing the trials, tribulations and successes of using sourdough starter. I’ve always wanted to do this and was thinking about it just last weekend. My grandma always made the best, and tiniest little cinnamon buns from a bunch of starter that she kept in her fridge. They were so good. Just a day or two later, my friend invited me to join the group (which is an open group if you are interested). I’ve decided to follow the recipe offered by Mary Jane Butters (of Mary Jane’s Farm). She has this whole 7 day cycle of feeding and loving and caring for the “mother”. 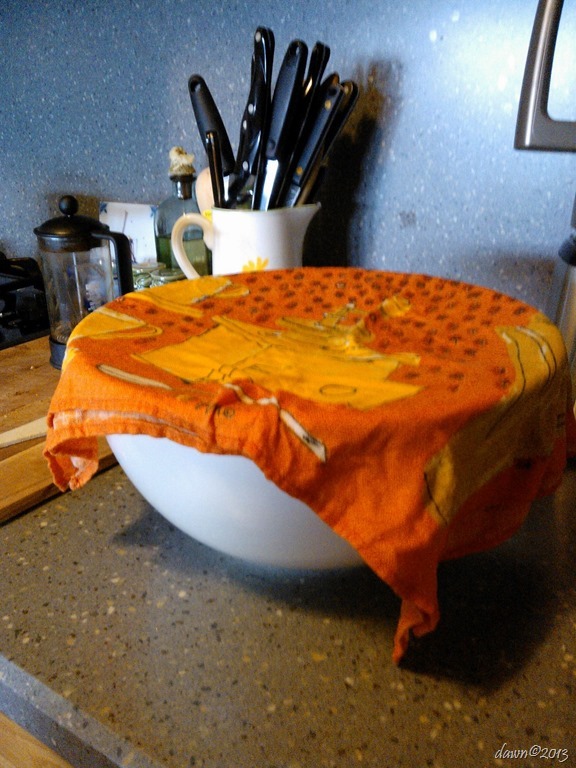 On Saturday I combined 2 cups of flour and 1 1/2 cups water in a ceramic bowl and covered it with a wet dishcloth. For the next five days I’ll stir in 1/3 cup flour and 1/4 cup water. Next Sunday I can take out two cups to make a loaf of bread, then continue the cycle of feeding and using the dough. As an aside, I used a combination of spelt and kamut flour because I love Bob’s Red Mill products. So far the group has lots of tips (adding rye flour) and the question of leaving the starter on the counter or in the fridge is up for debate. I’m excited to think that in a few weeks I’ll have quick source for artisan bread. Rather than buying store bought we’ll have homemade. At least we’ll see. Now and then I’ll be talking a little bit about the things that I do besides printing and stitching. And for those who ask, “How does she find the time?” let me just say, I don’t do housework. My house is a wreck. And I’m okay with that.